Arjeplog: At Hyundai Mobis Proving Ground in Sweden, just an hour’s drive away from the Article Circle, Hyundai Motor Company subjects its latest electrified vehicles to the most extreme sub-zero conditions. Rigorous testing ensures winter-proved operation of Hyundai’s electrified vehicles in temperatures as low as -35°C. 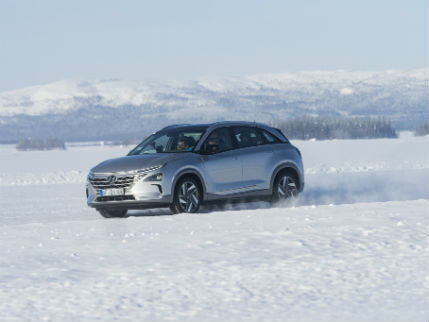 The previous generations of FCEV faced a significant technical challenge to be started in temperatures within -10°~-20° C. In order to overcome the technical challenge, the Hyundai engineers designed a new component to heat up the fuel cell stack of the Hyundai NEXO in sub-zero conditions. Thanks to this clever thermal management strategy, the Hyundai NEXO can be started at -30° C, which is on par with any other types of internal combustion engine powered vehicles. The other technical challenge typically found with FCEVs is ice formation within the fuel cell stack after the vehicle is turned off, as water is the only byproduct of electricity generation through hydrogen. Utilizing a blower system attached to the fuel cell stack, when it is turned off, the Hyundai NEXO removes water before it becomes frozen. At the apex of Hyundai’s eco-friendly vehicle line-up, Hyundai’s first dedicated hydrogen-powered SUV, the Hyundai NEXO boasts the best range within the fuel cell and EV car segments, delivering an estimated 800 km from a single charge (under NEDC testing). Previous articleVIT B School extends application window by just two days.